You are the key that unlocks so many of the accomplishments achieved through our work at FOCUS. Give during Lent and we’ll send you a free keychain! Subscribe to our e-news and follow us on facebook to make sure you’re up to date. So much of my personal journey in Orthodoxy has been a growing understanding of the Body of Christ, including the interconnectedness I have with each person around me as a fellow human created in God’s image. Equally part of this journey has been my study of The Ladder of Divine Ascent. In The Ladder, St. John Climacus calls each of us to a life long journey, always moving toward Christ. This journey includes breaking our connection to the worldly cares, tackling our physical and spiritual passions that distract us, and refocusing our attention on attaining the fundamental virtues that propel us up “the ladder” toward the revelation of the eternal love and peace that can only be found in Christ. As humans striving to live in the world, but not become part of the world, reflecting on the message of St. John Climacus can be challenging – or even daunting. Often, when we face our own shortcomings, we can become harsh and fail to treat ourselves with the compassion that Christ would extend to us. This, at least, has been my experience. As my experiences have grown in the Church, I now see that my journey is not unique. The Church has taught me that every human is created in the image and likeness of Christ – a living Icon worthy of veneration. The words of St. John Climacus, however, remind me that we all are still human. We are all still subject to temptation and sin, and we often need each other when we are climbing up (and trying not to fall off) the ladder. As part of the Body of Christ, I am surrounded by individuals who struggle with similar weaknesses, fallacies, and passions as I do. None of us, as an individual, is strong enough to climb the ladder alone. For this reason, we climb the ladder together… we climb together as the Church. When I succumb to my weaknesses and passions, I separate myself from the strength of the Church and those brothers and sisters with whom I share this journey. However, I cannot become so focused on my own journey to ignore when my brother or sister has fallen. Even though my neighbor may be struggling with a different physical or spiritual passions than me at any given time -some of us with slander, others with lust, others with vainglory – we must each see that these passions of my neighbor are not any less or worse than my own. It is that spirit that it becomes very important that we should not seek to fix or help each other, for this suggests an imbalance. Instead, as fellow climbers in the Body of Christ, we must serve each other in Christ’s example. Are we willing to see in each person we encounter, even those we do not know, or even like? This is our challenge… to serve the sick, the naked, the imprisoned, the stranger, and to welcome them in the Body of Christ, for the sake of each of our salvation. As we climb together, we strive to obtain the virtues of meekness, humility, and discernment, so that together, as the Body of Christ, we might all attain the unity found only in His Love at the top of the ladder. Great Lent is a crucial journey and a treasured gift. It’s this extended, intensified period of time that reflects what can actually happen in a day, a minute…a moment. We are always living and making choices, always experiencing places of suffering and death in our lives, and always existing in the joy of the empty tomb. When we step into this journey as a citizen of the Kingdom, then the journey is a movement towards the Lord and others. If we allow the Lord’s Kingdom to be as present as it is, then we will seek it at every moment. Kingdom moments show up every day. The Kingdom is touching us and everything around us. When God’s design for us is realized, there His Kingdom is. When we come together in love, when we allow ourselves to be drawn to someone’s joy or pain, when we eat and sit together in community…these are realities of the Kingdom breaking into this world. Our lives are a compilation of movements we choose and the circumstances we find ourselves in. If through all of it, we respond as one who is seeking to realize God’s call, then we will truly die before we die. What I mean is that our lives are meant to be sacrificial offerings. 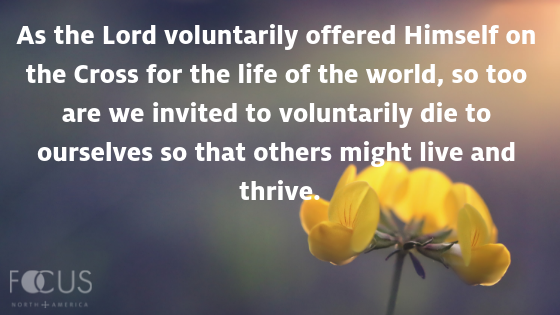 As the Lord voluntarily offered Himself on the Cross for the life of the world, so too are we invited to voluntarily die to ourselves so that others might live and thrive. What does it look like to die before you die? In the middle of Lent, we are presented with the Cross. It is given to us to boost our strength and remind us where we are headed. We often say that everyone has a “cross” to carry…which is a way of saying that every person has a burden that they bear and struggle with as they walk through life. This is very true but following the Lord to the Cross isn’t just about bearing our burdens. It’s about bearing the burdens of others. When we look at the Cross held high, we should also remember the victory and the power of our Lord’s sacrificial love. The text of the baptismal service proclaims that we are baptized into His “death.” Taking up my cross means that I set myself aside and allow the Lord to send me into the world to die for it. This dying before we die will look differently for each of us, as we are set apart for different offerings. But it begins with our trust and hope in what the Lord can do with a willing heart. “I am the handmaid of the Lord. Let it be according to Your will.” These powerful words wake me up every time I hear them. It is with these words that Mary accepts that she is Theotokos, God-bearer. By answering this call, she takes her place in God’s salvation story for the world. She takes hold of her role in God’s plan and lets go of herself. By doing this, she becomes her true self. Our lives are a constant preparation to hear and to answer as she did, pushing through fears and setting aside what we perceive our lives should look like. God speaks to us in our hearts. He has placed pure desires there that draw us to people and places where His will is realized. If our lives are clouded with pursuing our own rewards and successes, we may not be able to hear our Lord when His loving call comes. Pursuing an occupation for sustainability is different than pursuing your vocation. The wrong pursuit with distorted motivations will likely leave you consistently miserable, empty, and in a state of longing. To discover your calling, there are some questions to explore. What is the thing that, when you do it, people receive good things from it? Your unique calling is the best kind of difficult and leaves you exhausted in a fulfilling way. It brings you and others deep joy. Be open to discovering it, and when you do, let it evolve and take different forms. Through it all, trust that you will be taken care of when you are living out who you truly are. If you have inner peace, do whatever you can to preserve it. If you don’t have it, pursue it relentlessly. Look to the spiritual guides and mentors in your life to help you find the best ways to pursue it. Different things will work for different people. Ultimately, you want to be able to lay your head on your pillow at night with a smile, having closure and resolution on the things that cause unrest in your heart. Inner peace is a constant pursuit rooted in prayer and repentance. There will always be external disturbances around us that we can’t control; things that are up in the air, crisis, transition, and the list goes on. The state of peace in our hearts will determine how we process the external turbulence. Pursuing your own inner peace benefits everyone. Our lives are not a bunch of boxes that are separate. We have one life to live and one person to be. There are different roles we have and different things we do. But you will truly live in the Kingdom if you don’t draw lines in your life. My spiritual Father once said that there aren’t times when our spiritual life is turned off. We either live in the Spirit or we don’t. Everything we do is spiritual if we do it as a servant of God. The way we play sports, watch sports, watch TV, and even the way we exist in our church community. Show up wherever you are as someone who is the Lord’s and you will feel oneness on the inside and, God willing, create oneness in your environment. If you are able, work to heal the divisions that exist around you: conflict with others, unhealthy separation of groups, fear of unfamiliar people and places. Choosing healthy relationships is different than being against someone. It’s better to think about how you spend your time, rather than who and what you cut out of your life. I choose to eat well. I choose to exercise. I try not to choose words or actions that foster conflict or division. It’s the Lord’s design for humanity that we come together and exist as one body. Look around and see if you can play a part in healing broken relationships or communities. Take time to stop and ask yourself “why.” Then, with every step, focus your why on the Kingdom…and you will die before you die. It is this triumphal procession which strikes me as I write today. A procession of faithful believers, holding icons or images of Christ, Mary His Mother, the Saints, scenes from the scriptures including the cross and the resurrection on the third day. The imagery of the procession reveals something profound – the more notable icons in the procession are not the ones made by human hands at all, but rather, the very people who were carrying the icons themselves. The historical scene was a procession of icons carrying icons, images carrying images. In honoring holy icons, we show honor and respect to humankind, God’s greatest creation. In fact, God is the first and chief iconographer, and we are his masterpiece. This is how we at the St. Herman House – FOCUS Cleveland and more broadly, FOCUS North America, see everyone we serve, as a masterpiece created by God. We do not deny the brokenness of the masterwork, but if Christ Himself voluntarily suffered for the sake of His broken masterpiece, then so must we. Sometimes it is hard to see what God sees. We must rely on what we believe and our spiritual eyes. And what we believe is true, beneath the hurt – a masterpiece, beneath the addiction – a masterpiece. Beneath the mental and physical maladies – a masterpiece, beneath the anger, despair, sorrow, grief – all of it – a masterpiece. You must see it, you must strive to see what God sees, what Christ died for, what all of us are – created in His image. Each day the procession begins, God’s broken masterpieces processing through the doors of St. Herman House and FOCUS North America’s outreach centers seeking food, clothing, shelter, compassion, hope, love, and something of which they may not even be aware, the God who made them, the Savior who died for them. So let us venerate these icons! Let us greet these images with a holy kiss! Without such veneration our work is vain, our efforts are misguided, and our understanding of the great nature of our work on behalf of Jesus Christ, the Lover of humankind will be void. May God richly bless you all on your journey to the empty tomb! Almost 46 years old, John had lived with his mother, with friends, homeless shelters, had been in and out of jail, but had never had his own apartment. After living at FOCUS Cleveland’s St. Herman House for a year and a half, John had finally been approved for affordable housing. He went to see his new apartment and then returned to St. Herman’s to say thank you. He came into director Paul Finley’s office, reached into his pocket, and held up the key to his new apartment. “I got the keys to my new place,” he said. Paul congratulated him and commended him on his achievement – he had been working closely with a social worker and had worked hard at St Herman’s, often cooking meals for residents and guests. Like John, so many people have been helped and healed through our good work together. By making FOCUS part of your Lenten almsgiving, you can help men like John get on their feet. As Orthodox Christians, we know that almsgiving is one of the pillars of our Lent. By making FOCUS part of your Lenten almsgiving, you can help men like John get on their feet. You are the key someone’s success. To show our gratitude and as a reminder that you have been key to serving men like John, if you make a gift using this online form, we’ll send you a special keychain. Make a Lenten gift today! Here are 10 ideas we think would be great ways to kick-start serving others in your communities! Organize a drive for your local food bank! When you drop off the items, ask about other ways you can get involved throughout the year. Cook a meal at your local homeless shelter. Don’t be afraid to sit and talk with residents after meal service is done…you might meet a new life long friend. Connect with your local women’s shelter – inquire what their regular needs are and see if your women’s group can offer to help once a month. Decorate cards for veterans during Sunday school and deliver them to your local VA office. Young professionals – organize a workshop to help craft resumes for job seekers who might need help putting their best foot forward. Host it at your parish hall OR go to a local vocational school, shelter, or community center. Buy a pack of index cards and write inspirational messages on each one! Keep a few in your purse, pocket, glove box, etc. so if you encounter someone in need of a little extra joy – you have some to spare! Collect new socks and underwear for your local homeless shelter – simple basics that we often take for granted! Keep $5 on hand to give to a homeless stranger or anyone you may meet in a time of need! Challenge yourself to remember that “need alone is a poor man’s worthiness” (St. John Chrysostom). See an idea you like? Take Action! 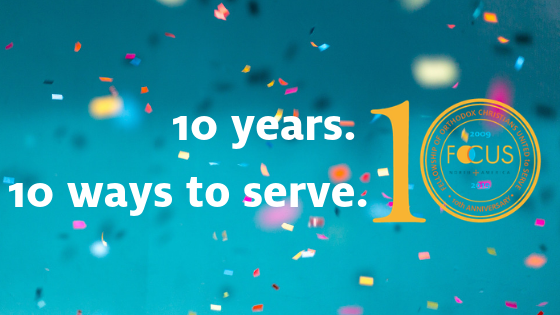 Help us celebrate our 10 years of serving others and join us in embracing your community through Christ-inspired service. Do Our Relationships Offend Divine Love? God forgives, and I forgive. Why ask forgiveness from someone I have not offended? Why offer forgiveness to someone who has done nothing to offend me? “The Church reveals to us that there are much subtler ways of offending Divine Love. These are indifference, selfishness, lack of interest in other people, of any real concern for them—in short, that wall which we usually erect around ourselves, thinking that by being “polite” and “friendly” we fulfill God’s commandments. The rite of forgiveness is so important precisely because it makes us realize – be it only for one minute – that our entire relationship to other men is wrong, makes us experience that encounter of one child of God with another, of one person created by God with another, makes us feel that mutual “recognition” which is so terribly lacking in our cold and dehumanized world. This excerpt from the introduction to the booklet, Forgiveness Sunday Vespers, published by Department of Religious Education of the Orthodox Church in America, says regardless “offense” to our neighbor, we are all guilty of offending Divine Love when we build walls around ourselves and fail to encounter and recognize Christ in each other. Let these words sink in. The way we are used to relating to each other on a day to day basis is wrong! We offend Divine Love when we are content with living lives that are separate from each other. We build walls around ourselves. We build walls around groups of people “different” than us. We build walls that keep us from experiencing and sharing Christ’s Divine Love. Trying to overcome this offense, which we have grown numb to in today’s society, is what inspires the approach FOCUS takes to living and serving, both in the church and in our surrounding communities. In order for us to serve and have that service become anything meaningful in our lives or the lives of those we serve, we must break down these divisive walls. Have you ever heard the saying about what happens when you assume? Let’s just say – the outcome is not good! Our assumptions can lead us astray if we do not take the time to learn about the reality of a situation. It might be easy to look at someone begging on the street and assume that they are too lazy to find a job, and therefore to blame for their situation. However, when we take the time to learn about homelessness and employment, the reality is between 40 and 60 percent of the homeless population participates in either part- or full-time work throughout the year. Has someone ever come to you with a problem and your immediate reaction is to spew out advice or take aggressive action in a failed attempt to fix their problem for them? When someone is in need, fixing isn’t always the right approach for a few reasons. First – it assumes that the person you’re trying to fix is broken. Second – it assumes that the “fixer” is not broken. The truth is, we are all broken and in need. 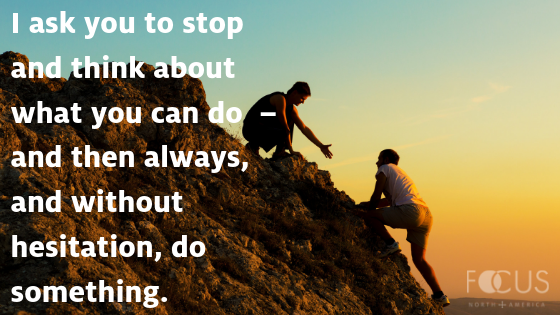 Advice and action are sometimes needed, but only after offering a listening ear. Stepping in stride beside someone who is going through troubled times allows for us to recognize our own brokenness and truly SERVE in the spirit of Christ’s love! We have written before about stereotypes vs. compassionate thinking. In every encounter, we have to challenge ourselves to reach out with compassion instead of judgment. To judge others requires separation. If we recognize that each of us is made in the image and likeness of Christ, there would be no room to judge because we would be venerating and loving each other instead! A man once asked some of his friends the following question: “What comes to mind when you hear the word ‘ministry’?” He received many answers to the question, but two of them were rather unfortunate. “That’s Father’s job,” his friends replied. Ministry simply defined is serving others. The fact of the matter is that every Orthodox Christian is called to ministry. That is, we are all called to serve. Every year on Meatfare Sunday, two Sundays before the beginning of Great Lent, we hear the Gospel account of the Final Judgment (Matthew 25:31–46). Christ gives a sobering account of the judgment of the righteous and the wicked. The righteous inherit eternal life, having acts of mercy as evidence of their faith in Christ. The Lord places them at His right hand, stating “Truly, I say to you, as you did it to one of the least of these My brethren, you did it to Me.” The wicked, on the other hand, are sent to eternal punishment for their lack of mercy. “Truly, I say to you, as you did it not to one of the least of these, you did it not to Me.” Our Lord identifies with those in need, and our response to them is an indication of our response to Him. While it is important to look after our friends and relatives and to serve them during their times of need, Jesus clearly states that we benefit when serving those who cannot repay us. In the Final Judgment passage, He uses the following people as examples: the hungry, the thirsty, the stranger, the naked, the sick, and the imprisoned. So if serving is important for us as Orthodox Christians, how do we lead our children to it? Children can be quite impressionable. Parents, grandparents, and godparents often have a profound impact on the younger members of their families, particularly in matters of faith. Their example, or lack thereof, has the potential to shape children’s attitudes toward the Church and serving others. It is essential to make Orthodoxy a regular part of a child’s life as early as possible, both on Sunday in church and throughout the week at home. In addition to praying together daily as a family, it is also wise to reinforce your child’s Church school lesson from the previous Sunday. Furthermore, families should make charitable service a regular component of their lives. If your son or daughter happens to ask why your family is visiting the sick, attending Orthodox prayer services at nursing homes, or volunteering to feed the hungry, you may simply respond that “Christ wants us to do this.” Stated another way, genuine Christian faith influences our actions. Orthodoxy is not just a religion; it is a way of life. There are numerous ministry opportunities for Orthodox Christians both in the parish and in the community at large. Most parishes have ministry opportunities such as altar servers, choir members, chanters, readers, greeters, church school teachers, and many more. It is also important for us to serve those who are beyond our home church’s walls: the community at large. Though opportunities may vary from one city to another, there are many Orthodox ministries that are in need of volunteers and/or donors. Ask your priest how you may get involved in one or more ministries at your home parish, and discuss the possibilities with your children. Come up with a project that works for your family. Christ teaches us about mercy: “Be merciful, even as your Father is merciful” (Luke 6:36). May we emulate the mercy of Christ as we serve those around us.